Tecan has further extended the flexibility of the Freedom EVO Liquid Handling (LiHa) Arm with the launch of a 5 ml disposable tip. Previously only available to Tecan customers working with fixed tips, the unrivalled pipetting volume range offered by the LiHa Arm can now be exploited by customers who require the highest levels of sample security. With over 30 years of experience in advanced liquid handling for life sciences, Tecan understands that flexibility is crucial to making laboratory automation work for you. Our FlowThru ™ Technology-based liquid displacement systems and automationexpertise have established Tecan as a market leader in laboratory liquid handling solutions, and we will soon be offering even greater choice by expanding our portfolio to include an air displacement pipetting arm for our Freedom EVO workstations. The P4 Inserm-Jean Mérieux laboratory in Lyon relies on the flexibility, robustness and reliability of Tecan’s Infinite® 200 PRO monochromator-based microplate reader for absorbance-, luminescenceand fluorescence-based assays on Risk Group 4 pathogens. The P4 Inserm-Jean Mérieux laboratory in Lyon is a highly secure laboratory, the largest of its category in Europe, affiliated to the French National Institute of Health and Medical Research (INSERM), and open to national and international scientific teams that need to handle Risk Group 4 pathogens. P4’s main activities include diagnosis, research, biosafety and trainingon agents responsible for viral hemorrhagic fevers (Ebola, Marburg, Crimean-Congo hemorrhagic fever and Lassa) and fatal encephalitis (Nipah and Hendra). Tecan’s Freedom EVO® liquid handling platform has enabled Nurex to enhance its production of monoclonalantibodies, improving efficiency and increasing the number of clones obtained from each fusion. Nurex is a biotechnology company based in Sassari and Turin, Italy, that specializes in the production of advanced diagnostic tools for biomedical applications in genomics, proteomics and clinical diagnostics. 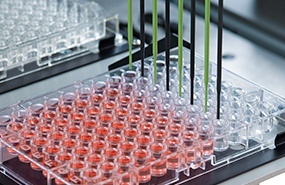 Scientists at the AstraZeneca Innovation Center China have developed a novel technique using a Freedom EVO® system for temperature-dependent automated preparation of cell culture plates for candidate compound screening. By precoating microplate wells with agar prior to pipetting the BD Matrigel™, the team is able to perform 3D cell-based assays in a 96-well microplate format. Researchers at the Institute of Entomology (ENTU) in the Czech Republic are studying insect circadian clocks and have used Tecan’s Infinite® M1000 plate reader to automate hourly luminescence measurement of transgenic Drosophila. Automation enables large-scale screens of mutant Drosophila strains to be performed, involving hundreds of measurements over a period of up to two weeks. The Swedish national biobanking infrastructure, BBMRI.se (BioBanking and Molecular Resource Infrastructure of Sweden), has initiated a pilot study for the improvement and national harmonization of biobanking procedures in clinical cytology. Following a national procurement process, the first of 10Freedom EVO® liquid handling platforms has been installed in the Clinical Cytology Biobank at the Karolinska University Hospital. 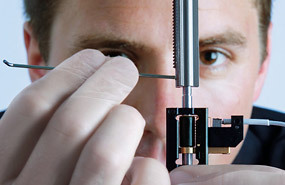 A network project jointly funded by the Swiss Confederation CTI (Commission for Technology and Innovation) and Tecan, bringing together industrial, academic and clinical partners such as the Zurich University of Applied Sciences (ZHAW) and the University Hospital Balgrist in Zurich, has developed a successful automated system based on the Freedom EVO® platform. The system isolates and cultivates cells from human intervertebral disks, improving reproducibility and encompassing all-importantintegral quality control. Blood safety is a serious concern for countries worldwide and China is no exception to this. For many years commercial blood donation has been prohibited in China, and the Government has adopted a systematic approach to continually improving blood quality, from the initial donation through to collection, transportation, screening and finally, transfusion in a hospital. Tecan recently hosted the fourth annual Tecan Symposium, welcoming leading genomics, proteomics and biobanking experts from around the globe to discuss this year’s topic; Translational Medicine: From bench to bedside and back. Customers in Australia, New Zealand and the Pacific Islands have welcomed the news that in early 2012 Tecan Australia became a fully owned Tecan subsidiary. A new facility in Melbourne and local presence in several major cities reflects Tecan’s uniquely strong commitment and continuing investment in the Australasian market. The new Melbourne base houses a comprehensive sales and support organization, complete with a workshop and additional facilities for customer training and demonstrations.